While we recently learned Pharrell Williams is part of the new Blink-182 album, the band's Mark Hoppus has explained that doesn't mean it's going to be all "Happy." In fact, according to Hoppus, we can expect the exact opposite, with him calling the album "more aggressive" and "darker." In a new interview with NME, Hoppus explained Blink-182 have a massive pile of songs ready for their follow-up to 2016's California. 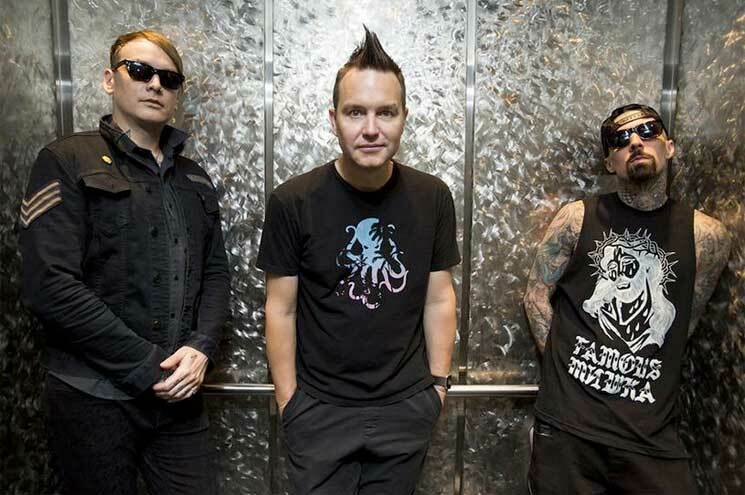 In fact, Hoppus revealed the band so far have more than 40 new tracks recorded for the as-yet-untitled new Blink-182 album. "It's very different to California," Hoppus said. "It's a lot more aggressive. It's darker in theme and tone. If you like California to Enema of the State then this album is more like the untitled record where we are trying to experiment more: trying to experiment more, trying different sounds, and trying to expand upon what people think Blink-182 is." He also spoke about the lyrical tone, which goes for both the new Blink album and the upcoming EP from Hoppus' new band Simple Creatures. "They're both quite personal. I think that the world is quite a strange place right now in general. People are really wound up, everyone is on edge and that seeps into everything that you do," he said. "There's also a lot of hope and positive things happening in the world. Hopefully we are moving the world in the right direction, even in the face of all of these strange obstacles." As previously reported, Blink-182 drummer Travis Barker revealed Pharrell would be on the new album, as well as a producer called the Futuristics. "So it's kind of anything goes — it's the same vibe going on as we had with self-titled [from 2003]," Barker said. "Literally, anything goes. And I think we're creating one of the most important Blink albums." Barker also said the album would "definitely be out before the Warped Tour," which Blink will play during the Atlantic City stop on June 29 and 30. In addition to the new Blink album, the band revealed they would be playing the entirety of Enema of the State at the Back to the Beach festival, which takes place on April 27 and 28 in Huntington Beach, CA. Simple Creatures — Hoppus' band with All Time Low's Alex Gaskarth — will release their Strange Love EP on March 29 via BMG. You can check out the newly shared EP track "Adrenaline" down below. Blink-182/All Time Low Offshoot Simple Creatures Share "Strange Love"